Basia Irland: Artist, Writer and Professor. Tome I: Mountain Maple, Columbine Flower, Blue Spruce. 2007. Boulder Colorado. Courtesy the artist. 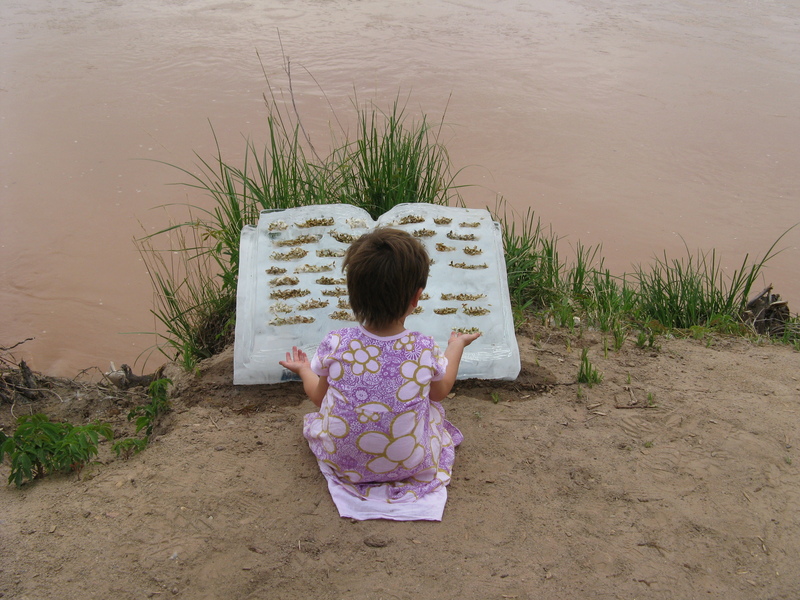 Thus was born my project Ice Receding/Books Reseeding, an effort to draw attention to climate disruption and glacial melting, and to connect communities to their local rivers and the importance of their watersheds. 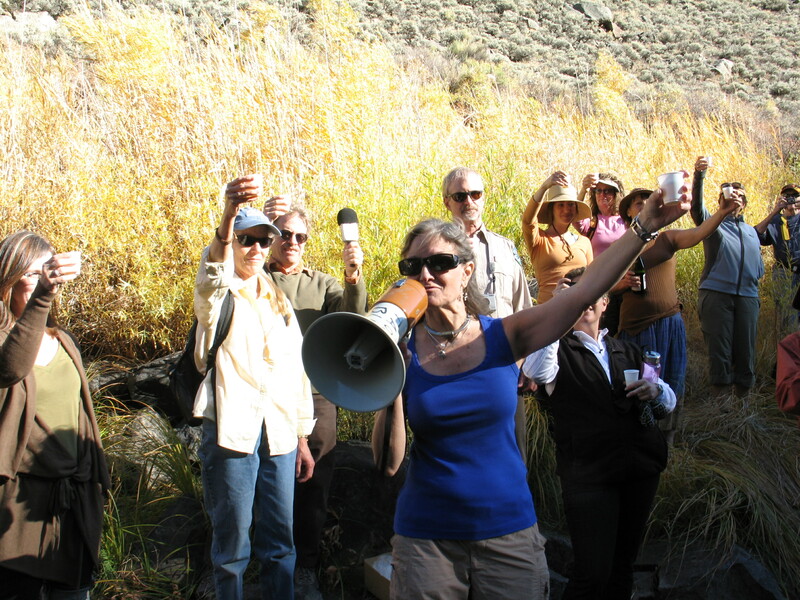 For the people of Boulder, the question was: when the Arapaho Glacier melts away, to what source will they – and local fish and wildlife – turn for their water? 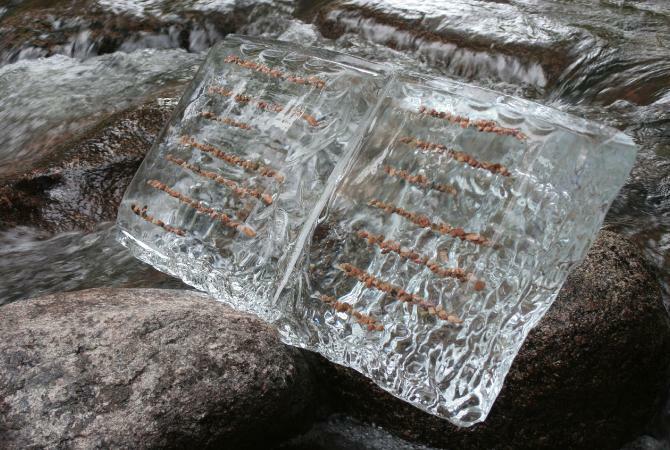 Each project begins by carving frozen river water into the form of a book. Some books are large and weigh as much as 250 pounds; others are the size of a pocket-book. 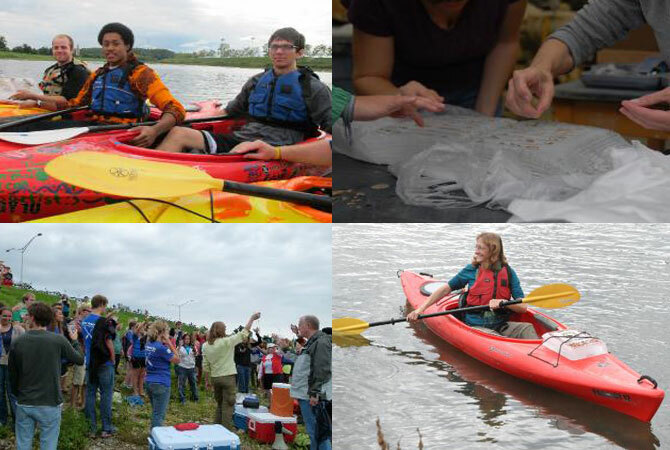 Each is then embedded with an “ecological language” or “riparian text” consisting of local native seeds. The book is then placed back into the stream. Closed books have seed patterns on the covers, while open books have rows of seeds forming sentences and paragraphs. These seeds are released as the ice melts in the current. Where the seeds choose to plant themselves is serendipitous, replicating the way seeds get planted in nature. In future book launches, we plan to attach a probe to monitor temperature, light, and dissolved oxygen, as well as a micro-cam to gather data about where the current takes the seeds and how they get deposited along the banks. A GPS will also be installed to pinpoint locations. “Receding/Reseeding” NeoRio 2009 – Courtesy LEAP – full project including image credits . Great Miami River, Dayton, Ohio. Images: Courtesy of the artist. With supporters and collaborators, I have launched ice books into rivers in Belgium, France, Italy, Spain, and across the United States and Canada. Riparian seeds have been released into spring-borne streams in Missouri, languid creeks in North Carolina, and rust-red acid mine drainage in West Virginia’s Deckers Creek. I have documented many of these launchings in my Ice Receding/Books Reseeding, which I began producing in 2007 and continue to update as new projects develop. Basia Irland, Artist, Writer and Professor Emerita, University of New Mexico, works with scholars from diverse disciplines and community groups building rainwater harvesting systems; connecting communities along lengths of rivers; filming and producing video documentaries; and creating waterborne disease projects internationally. She has completed projects along twenty-six international rivers including the Blue Nile in Ethiopia, the White Nile in Egypt, and the Bagmati River in Nepal. Irland has received over forty grants including a Senior Fulbright Research Award, Woodrow Wilson Foundation Fellowship Grant, National Oceanic and Atmospheric Research Grant as well as interdisciplinary awards from the U.S. Bureau of Reclamation’s Water Conservation Program and U.S. Fish and Wildlife Department. In 2015, Irland wrote a series for National Geographic’s Water Currents. 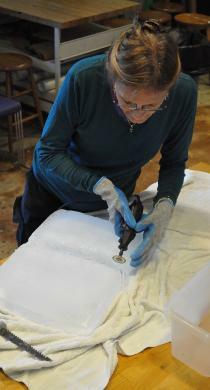 Irland’s work can be found in the National Museum of Women in the Arts, Victoria and Albert Museum, and the Corning Museum of Glass collections. In November, 2015, Irland will have a retrospective at Museum Het Domein, Sittard, the Netherlands. www.basiairland.com.